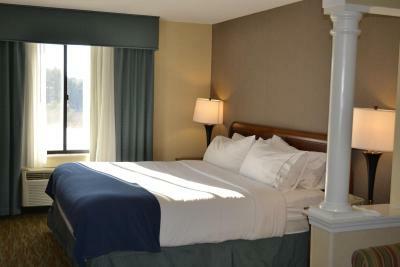 Lock in a great price for Holiday Inn Express Hotels Biddeford – rated 8.8 by recent guests! Comfy beds. Cleaning staff was excellent. Great location. The breakfast was a great option,saved time and money versus going out for breakfast. Breakfast was awesome. Front desk staff went above and beyond for whatever we needed. I would definitely recommend this hotel and visit again myself. room was clean and bed was comfy. Location was excellent. The shower was awesome! The room was spacious and comfortable. The breakfast was good and had options for someone (like me) who is gluten free. Hotel was very quite. Easy check in and location was very central. The bed was very comfortable. Room was clean and comfy. Wide range of breakfast choices.convenient location to highway.very friendly staff. Bed was very comfy. Breakfast was great. Loved the heAlthy options. Nice place to stay when you're away from home. 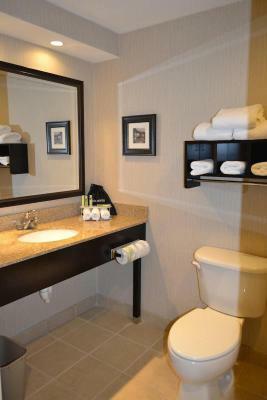 Holiday Inn Express Hotels Biddeford This rating is a reflection of how the property compares to the industry standard when it comes to price, facilities and services available. It's based on a self-evaluation by the property. Use this rating to help choose your stay! Featuring a complimentary breakfast buffet, this Biddeford hotel is located just a 2-minute drive from Interstate 95 and features an indoor pool and a fitness center. A microwave, refrigerator and flat-screen cable TV are provided in each guest room at Holiday Inn Express Hotels Biddeford. The private bathrooms include a hairdryer. 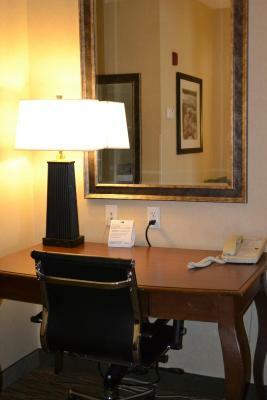 A 24-hour front desk is provided at the Biddeford Holiday Inn Express. Free Wi-Fi access is available. Aquaboggan Water Park and Saco Bay are both 10 miles from the Holiday Inn Express. The property provides free parking. This property also has one of the top-rated locations in Biddeford! Guests are happier about it compared to other properties in the area. This property is also rated for the best value in Biddeford! Guests are getting more for their money when compared to other properties in this city. 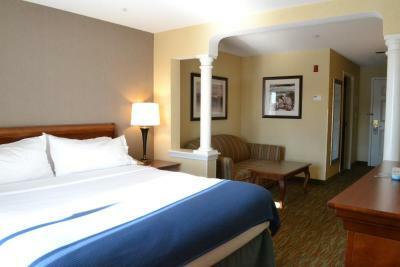 When would you like to stay at Holiday Inn Express Hotels Biddeford? This room features a spa tub, microwave, refrigerator and flat-screen cable TV. 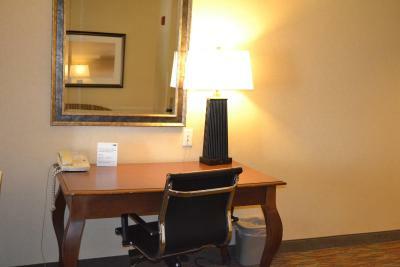 This room features a sofa bed, microwave, refrigerator and flat-screen cable TV. House Rules Holiday Inn Express Hotels Biddeford takes special requests – add in the next step! Holiday Inn Express Hotels Biddeford accepts these cards and reserves the right to temporarily hold an amount prior to arrival. I was put in a handicap room and it was very difficult to shower. Also the bathroom had a draft so it was very cold. Super clean room and comfy bed! Someone had been smoking weed around or in the elevator, not the hotel's fault. Everything was great, clean, pleasant, comfortable. Parking lot well plowed during snowstorm so we were able to leave early on schedule. The beverage machine was sold out on New Years eve and New Years day and no alternate accommodations were made for this inconvenience. Limited exercise room, no free weights. Pool was closed. There really wasn’t anything we didn’t like. We were missing a hairdryer which the front desk quickly remedied. The pool is closed right now.